CRAZY DISCOUNT! Was: $799.95 Now: $499.95! 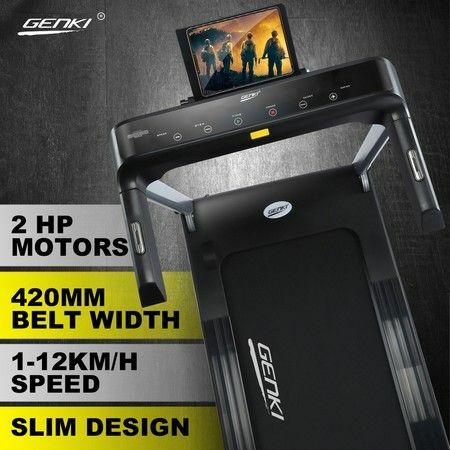 Fulfill your daily cardio exercises and keep your body in good shape on the Genki electric treadmill powered by 2HP motor which will offer you a durable impetus but quiet environment while running. The 12 pre-set training programs allow you to customize your own exercise habit. The large LCD digital display with visible distance, speed, time, calories, steps and pulse, ensures you to monitor your workout clearly. The maxi-grip running belt, the high-density rubber handlebars and the humanized safety key with clip are equipped to deliver comfort and extra safety for regular and intensive exercising. Moreover, the running machine comes with a pulse sensor attached to each soft grip handle to track the heart rate and the retractable device holder to match your various workout style. The compact and portable design also will make storing and transporting the treadmill much easier. Note: To avoid the risk of dropping, please do not put iPad or any other heavy objects into the tablet holder while running. 420x1160mm Wide running deck: Designed for a max user weight of 120KG with wide running surface supports your stride and keeps you low to the ground giving you a real running experience without the dangers of running outside. Portable wheels: Simply tip the treadmill to an angle, and now you can move the machine from room to room with ease with the transportation wheels. Minimal strength or effort required. Foldable: Slim size ideal for tight spaces. With a minimum height of only 26.5cm, the folding treadmill can be stored under the sofa, the bed or on the wall. Small footprint, easy storage, and portable type. Hand pulse grips sensors are conveniently mounted on the side handlebars to keep you in your training zone and achieving your goals.